Property Smart Investors - Remembering Lee Kuan Yew: A video is made to Remember Mr Lee Kuan Yew's Life Journey - This is a Tribute to Lee Kuan Yew for being a great leader. A video is made to Remember Mr Lee Kuan Yew's Life Journey - This is a Tribute to Lee Kuan Yew for being a great leader. Mr Lee, at two, on a tricycle in his Neil Road home in 1925 with his father, Mr Lee Chin Koon. Began Law School at London School of Economics, but later moved on to Cambridge University when Kwa joined him. They married secretly on 23 Dec, 1947 in Stratford-upon-Avon. merger's with Singapore; but changed his stand in 1961. 1963 Union Harbour Workers unrest (above). Mr Lee speaking to workers from the Singapore Harbour Board. promised a $2 million award for wage claims. He deregistered the union on 22 July, 1963.
had to collect their mails. that convinced Mr Lee that his partnership with Fong and Lim had to end eventually. shot at Lloyd Studio. this shot was taken the night before Mr Lee left for England to further his studies. The people stayed – wrapped in ponchos or under umbrellas and mats – in spite of the fickle skies. service on a route that was itself a tribute to him, cutting across the key sites that marked his life and career. Abbott, and former US president Bill Clinton. Widodo and his wife Iriana, Myanmar's President Thein Sein, South Korean President Park Geun Hye and Israeli President Reuven Rivlin. Dignitaries who attended the state funeral yesterday included former US Secretary of State Henry Kissinger, Indonesian President Joko Widodo and his wife Iriana, Myanmar's President Thein Sein (above), South Korean President Park Geun Hye and Israeli President Reuven Rivlin. a gun carriage through Singapore on Sunday. 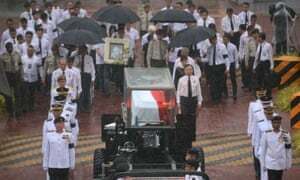 About 200 pilots stood in the pelting rain yesterday and saluted Mr Lee Kuan Yew, in a touching send-off for the man who once had a fractious relationship with their union. Dressed in dark blue jackets with peak caps, the pilots of Singapore Airlines (SIA), Silkair and SIA Cargo were led by Captain Tan Peng Koon, honorary secretary of the Airline Pilots Association Singapore, or Alpa-S.
Alpa-S had clashed with Mr Lee in the past as they drew his ire over wage disputes with SIA. Unionists and their families outside the NTUC Building in Collyer Quay. They started arriving as early as 9am yesterday. "We are doing it out of respect for Mr Lee. He's done so much for the country I want to be able to pray for him without holding anything in my hands." and the Tanjong Pagar CC to pay our respects, and now we are here to say goodbye to Mr Lee as he passes by Shenton Way." Mr Lee is a great man. Being here is our way of paying our respects to him as a family." Tanjong Pagar’s political representative when he died on March 23. 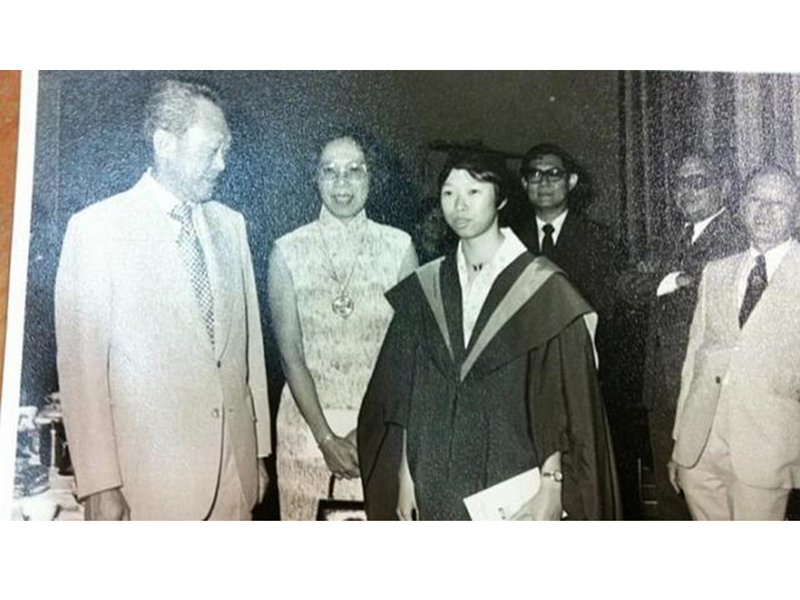 For businessman Laurence Ooi, 59, Mr Lee Kuan Yew was the reason he moved to Tanjong Pagar. Mr Ooi moved from Jurong West five years ago, buying a unit in the iconic public housing development, The Pinnacle@Duxton. The 50-storey complex has won design awards, and made headlines in January when a five-room unit sold for more than $1 million. National grief: Why such an outpouring? Road yesterday. Sree Harin knows English and Tamil and started picking up Chinese this year. It is the place that has witnessed it all in the last few days, from snaking queues of tens of thousands of people, to yesterday's 21-gun salute in honour of the nation's first Prime Minister. As Singapore mourned the death of Mr Lee Kuan Yew, the Padang was also the place where Singaporeans showed the best of themselves. 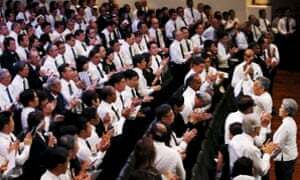 As Mr Lee lay in state at Parliament House from last Wednesday to Saturday, more than 450,000 people turned up to pay their respects. Never mind the queues of up to 10 hours through the Padang, or the scorching sun. Not a complaint was heard. Junction 8 mall, many came to a halt in front of a big screen outside the Bishan MRT exit. TRANSPORT STAFF: At Braddell, MRT station managers stopped work to observe a minute of silence (above). Over at Toa Payoh bus interchange, SBS Transit staff did the same thing. All over Singapore, buses were held back at interchanges, and trains pulled to a stop at stations during that moment of silence too. TRANSPORT STAFF: At Braddell, MRT station managers stopped work to observe a minute of silence. streets, waiting to pay their final respects as the cortege went past. 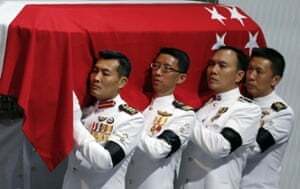 First, the Singapore flag draping the coffin was removed, folded ceremoniously, and handed over to the elder son. Then the coffin lid was lifted, revealing an open casket. 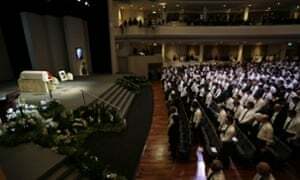 Inside, the body of Mr Lee Kuan Yew, Singapore's first Prime Minister who died last Monday aged 91, lay in repose. Some of the group of over 30 members of the Chua family at Bukit Merah with a banner they rushed to get printed. They gathered from about 8.30am, over four hours before the procession was due to pass through. 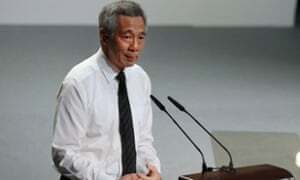 Singapore's Prime Minister Lee Hsien Loong and his wife Ho Ching thank attendees. Archbishop William Goh celebrated mass at Victoria Street's St Joseph's Church in tribute to Mr Lee Kuan Yew. Victoria Street's St Joseph's Church in tribute to Mr Lee Kuan Yew. Archbishop William Goh to pray Mr Lee and his family. Lee Kuan Yew for being a great leader. MAS dollar policy: More frequent updates needed?